Deer Ridge and Deer Run students benefit from having excellent public schools close to home. French immersion, Spanish bilingual, Montessori, and Catholic options are also available to residents, in addition to Calgary’s private school alternatives. Located within Deer Run itself, Deer Run Elementary is a fantastic educational opportunity. Many students walk to school from home, while others get dropped off after a very short drive. Kids are likely to make lifelong friends that live within the same community, solidifying their social development and opportunities to build positive relationships with others. Wilma Hansen Middle School is located in Queensland Downs, just north of Deer Ridge. Students from many different communities attend Wilma Hansen, which is known for having great technology, fine arts, athletic, and academic programs. More than half of Wilma Hansen students achieve honours, and the school takes significant efforts to acknowledge student achievement through a variety of measures. Lord Beaverbrook is one of Calgary’s major high schools, and offers a well-rounded range of academic and elective courses. Students who attend Lord Beaverbrook have a tendency to be successful in life, going on to achieve great things. Advanced Placement and Adapted Learning programs are available, ensuring students receive an education that challenges their specific skill-sets. Deer Run and Deer Ridge students are welcome to attend French immersion at Sam Livingston (K–4), Fairview (5–9), and Dr. E.P. Scarlett (10–12). The designated Montessori school for Deer Ridge and Run is Lake Bonavista (K–6) in the nearby Lake Bonavista community. Canyon Meadows (K–4), Robert Warren (5–9), Dr. E.P. Scarlett (10), and William Aberhart (11–12) are the Spanish bilingual program schools designated for Deer Run and Deer Ridge students. Deer Ridge and Deer Run have Catholic programs in both English and French-immersion options. English students can attend Don Bosco (K–9) and Bishop Grandin (10–12), while French immersion students may attend St Cecilia (K–6) or St. Matthew (K–9). 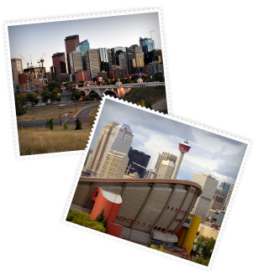 A handful of fantastic private school options can be found throughout Calgary, including Foundations For The Future Charter Academy, Foothills Academy, West Island College, and Calgary Christian School. The prestigious Strathcona-Tweedsmuir School, ranked as one of Canada’s top 25 private schools, is located 30 minutes away on the outskirts of Okotoks.